"I was looking forward to going home. And now I've found only strangers. In all honesty, I find František Vláčil's cinema hard to talk about, and not because it's too complex or difficult to interpret. The real difficulty comes when all you have at your disposal to do it justice are mere words. You could, of course, remedy this by presenting copious screencaps, pointing out elements you like, and yet, even in this form, it wouldn't be enough. Not by a long chalk. It goes without saying that his meticulously composed shots will look beautiful, but in doing so, you'll miss the motion. You'll miss the alchemy of it all unfolding before your eyes and the strange, haunting presence that resonates in every frame and maybe even between them. OK, I'll freely admit that what I'm suggesting may sound a little hyperbolic. However, what I'm attempting to describe is less ghost in the machine and more a presence of the director himself – and no, I don't mean his departed spirit – that he gives part of himself away with each film, and if you could, you'd probably see that very essence sandwiched between the stock and the image printed upon it. The speed of the projector or more appropriately the spin of the DVD drawer means we miss it physically, but feel it emotionally instead. This sensibility is something that Vláčil and only Vláčil can bring to the screen. His hands, though careful and steady are deft ones, more than able to handle complex and contentious material, in a way that seems fresh, interesting and honest even now, proven by the successes of his earlier epics The Valley of the Bees and Marketa Lazarová. In the case of Adelheid, made roughly at the mid-point in the director's career, all those attributes are most certainly put to the test. 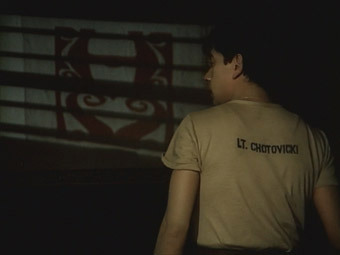 The film sees him reunited with Bees cinematographer František Uldrich, along with its writer, Vladimír Körner and leading man, Petr Čepek, who turns in another powerful performance as Lieutenant Viktor Chotovický. Though some will argue that the film fails to reach the heights of its predecessors, for myself at least, Vláčil passes, with flying colours, literally. Often, when directors hit upon a winning formula – whether that be reflected in fiscal returns or other accolades – they're drawn to replicate it and are afraid to try anything new. In that context, Vláčil could have easily turned is hand to another historical epic, instead he chose to make changes, to take, what is, for all intents and purposes a risk. Adelheid is not only the first film in which the director breaks away from the historical tradition; it's also the first he filmed in colour, and perhaps most importantly, is the first film to explore the experiences and treatment of Sudeten Germans in Czechoslovakia throughout the postwar expulsions of the 1940s. Instead of focusing on an entire group of people, Adelheid focuses on the relationship between just two: Viktor, a former RAF officer, recently returned to his homeland in the aftermath of World War Two, tasked with taking inventory of an abandoned mansion on the Czech-German border and Adelheid (Emma Černá) a German girl, daughter of its former owner who acts as Viktor's servant. With no common language – Adelheid cannot speak Czech and Viktor's German is limited to the phrase book he borrows from the mansions vast library – they can barely communicate but, they're clearly intrigued by each other, half attracted half repulsed. Often isolated and obviously lonely, Viktor progresses through the house, taken with books and family photographs he finds amongst the bullet-ridden paintings. 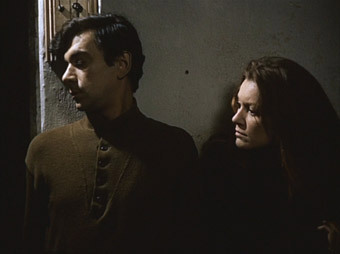 When local police inspector Hejna (Jan Vostrčil) arrives to check on him, he enquires about Adelheid and her past, curious to know about the young women he's living with. Rather than provide Viktor with the clarity he so obviously craves, Hejna's answers complicate the situation and his growing attraction toward her intensifies. In true Vláčil style, this focus makes for a claustrophobic film that's both tense and intense in nature. Though the mansion Viktor and Adelheid are effectively confined to – I feel that's no accident either – is indeed large, we never really get a sense of it's size or scale, since the story plays mainly in the kitchen, library and the room Viktor has chosen to sleep in. Through he explores, it never feels freewheeling, and he's always barricaded by something, whether that's a door, a window, the many discarded personal effects he has to catalogue or the measures he takes to secure the house using anything he can find. Time outside in the grounds for the pair is brief, born out of necessity rather than the luxury of enjoyment. Any reflection Viktor undertakes often happens at the dinner table with Hejna, glass in hand. Though he's in his homeland, you never get the sense that Viktor feels at home. The earth tone colour palette – which seems so extraordinarily odd for the first few minutes given the spectrum of light and dark Vláčil achieves in black and white – some wonderful cinematography from Uldrich and costume design from Theodor Pištěk combine beautifully to make Viktor blend in so well with his surroundings that sometimes it's hard to tell where he actually is in the frame. There are even periods when he (and sometimes Adelheid) disappears completely. Small details like this really stand out and elevate the film beyond that of a simple romance. Adelheid carries many of the director's trademarks: a slow-burn, low-key character study, that refuses to shy away from less palatable behaviour – Hejna and his men are a case in point that rather goes against the textbook accounts of the period. Even Viktor and Adelheid are allowed faults, most obviously in their desire for each other and this is where the film comes into its own. Their wordless quasi courtship is instead expressed through looking. 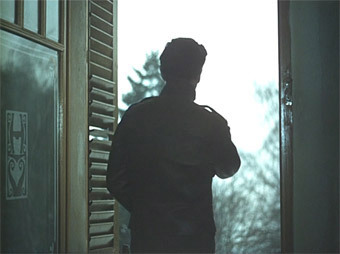 This is a film obsessed with observation – obviously connected the film's broader themes of identity and self-awareness – all they can do is watch, whether it be through windows or binoculars. In this respect alone, it'll give fans of Laura Mulvey's seminal work plenty of food for thought. Viktor and Adelheid's closeness is by turns compelling and suffocating. You want for them to find solace in each other and be happy, but in the back of your mind, the history they're living through looms large. This is no epic, sweeping love story, but it is one of the most beautifully made and complex films I've ever seen. Even now, it feels like I've only stretched the surface of what it has to offer its audience. The more thought you put into watching this film – and I'd argue that this also applies to the rest of Vláčil's output – the more you get back. There's a good reason why it's named in honour of its alluring, enigmatic though often challenging heroine: it has exactly the same qualities. Adelheid is a unique work; pure, honest and genuinely poetic in a way that cinema that cinema so rarely achieves. The picture has been restored for this DVD released, and although a few small flaws remain the results are for the most part very impressive. 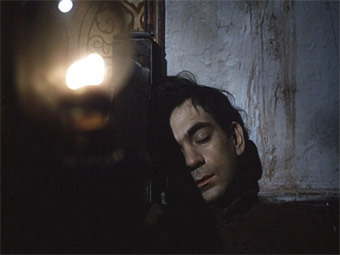 The sharpness and level of detail are consistently excellent, and the contrast is generally very well balanced, with the black levels only slipping in darker scenes (when Viktor opens window shutters to let light into a darkened room, or later when he starts to doze in fronmt of a fireplace), presumably to retain picture detail that would otherwise be lost. When the light and the picture elements are right, however, the contrast really pops. There's an earthy hue to much of the picture that may or may not be intentional (it's become increasingly hard to tell in recent years) and despite being cleaned up a fair few dust spots remain. On the whole, though, a very fine transfer. The mono 2.0 soundtrack has also been restored and is serviceable rather that ear-catching. There are no obvious pops of damage, but the range is slightly restricted and there is some audible background fluff in quieter scenes. The dialogie and music are clear throughout. This is yet another quality release from Second Run. Restoration work on the picture and sound means it certainly improves on the Facets disc currently available in the US (part of a two-disc set with Holubice/The White Dove). It's highly doubtful it can look any better than this. As this release's only extra, for myself at least, this had a lot to live up to. Thankfully, it more than rises to the challenge. In essence, this beautifully illustrated booklet is a ten-page plus tribute to the late Vláčil's life and work written by none other than Peter Hames, who will be familiar to regular readers of this site, Second Run aficionados, or indeed, admirers of Czechoslovakian cinema in general. The word authority is an oft overused one, but in Hames' case, it's entirely founded, since his words are clearly shaped by a vast depth of knowledge and passion for his subject, coupled with affection for Vláčil's work in particular. Though he takes a chronological approach – from the director's days in the Czech Army Film Unit right up until the late 1980s – each film is given its own moment to shine, with explored in detail some wonderful food for thought for textual analysis fans, its never dry or inaccessible. A particularly nice bonus comes in the form of the brief discussion of Tomás Hejtmanek's Sentiment, where Vláčil (played by the late Jiří Kodet) is the subject. I sincerely hope that in light of Vláčil's considerable body of work and their increased availability on DVD, Hejtmanek's film also finds a wider audience. Just one small note: if you're seeing Adelheid for the first time, then hold off on reading through this, since it does give away plot spoilers. Adelheid is a taut, powerful and compelling film. A Character study on the one hand and love story on the other, Vláčil's first colour film is not only a challenge from a visual perspective, but also an emotional one. Though it may not be one of the most well-known constituents of the director's output, it's no less interesting. This is a must for any fans creating intent on creating their own collection of the director's work or indeed, with a love of Czech cinema. Highly recommended.